[26-Feb-16] Ocean color observations enable the estimation of bio-optical proxies of phytoplankton biomass (e.g. chlorophyll a concentration, Chla, and particulate backscattering coefficient, bbp) in the surface layer of the ocean quasi-synoptically. In parallel, the Argo program distributes vertical profiles of the ocean physical properties with a global coverage and a high spatio-temporal resolution (every 10 days for ~3°x3° area). Because physical properties influence the vertical distribution of phytoplankton biomass, merging satellite and Argo data bear strong potential to infer the vertical distribution of bio-optical properties at global scale with high space-time resolution. 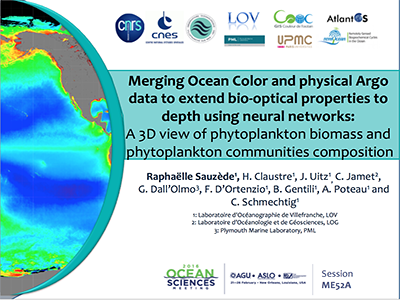 Two neural network-based methods (SOCA for merged Satellite Ocean Color and Argo data) are developed: one to infer the vertical distribution of Chla and phytoplankton community size indices (PCSI); the second for bbp. SOCA is trained and validated using a database of ~5000 concurrent vertical profiles of temperature, salinity, and bio-optical properties collected by Bio-Argo floats, matched up with satellite bio-optical products. In practice, SOCA requires as input only the vertically resolved physical properties and concomitant satellite products to extend the surface bio-optical properties to depth. Evaluated against 20% of our database, SOCA-retrieved bio-optical profiles are very consistent with measured in situ profiles (error within 40-55% for Chla and PCSI and of 18% for bbp). Additional validation based on fully independent data acquired during oceanographic cruises shows again very satisfactory results. The data used for training the neural networks are representative of the global ocean in terms of trophic and oceanographic conditions, making SOCA applicable to most open-ocean waters. Finally, global and regional 3D views of Chla, PCSI and bbp obtained from SOCA represent a new important tool to assess seasonal and interannual variability in phytoplankton biomass and community composition. Click here for the movie embedded in this presentation. Credit: Sauzede, R., Claustre, H., Jamet, C., Uitz, J., Dall'Olmo, G., D'Ortenzio, F., Gentili, B., Poteau, A., and Schmechtig, C..